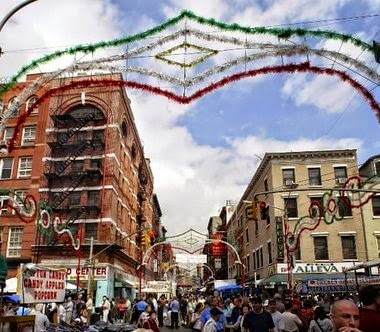 Genovese capo Conrad Ianniello, 70, who five years ago was found to be extorting vendors at the San Gennaro Feast, plead guilty to racketeering conspiracy charges, federal prosecutors said. He admitted to disrupting a Long Island company's labor union's efforts. He conspired with other alleged street guys in 2008 to "pave the way for an alleged Genovese associate, who was an official at another union, to unionize the company instead, prosecutors charge," according to SILive.com. He was caught on wiretap on April 17, 2008, thanking co-defendant and Genovese associate Ryan Ellis for delivering a message to the union not to organize the Long Island company. "You got his (expletive) attention. He called me," court papers quoted him as saying. "He says they got nasty. ... I said, 'I got your (expletive) attention now, don't I?'" Sal Zarzana who also plead guilty. 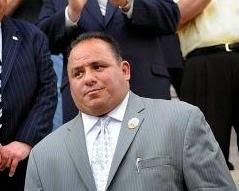 Reputed Genovese soldiers James Bernardone, 45, agreed to step down as secretary treasurer of Local 124 for extorting a contractor, and Sal Zarzana plead guilty to the same extortion scheme, the Daily News reported. Ianniello reportedly operates in Manhattan, Brooklyn and Queens. Conrad Ianniello is a nephew of former legendary Genovese figure Matthew "Matty the Horse" Ianniello, who died last year at age 92. A New York mobster better known for earning than killing, Matty the Horse was also a decorated WWII vet and owned the restaurant in which upstart Colombo mobster Joe Gallo got whacked in the 1970s. Ianniello and 11 other defendants, including seven affiliated with the Genovese family, were indicted last year in Brooklyn federal court for attempts -- also in 2008, busy year for this crew -- "to turn New York's largest street fair and longest-running religious festival [the San Gennaro Feast] into their own personal piggy bank by extorting vendors with threats of violence, federal prosecutors allege[d]." Among the charges for San Gennaro: racketeering conspiracy, extortion, illegal gambling, union embezzlement and obstruction of justice, said Loretta E. Lynch, U.S. attorney for the Eastern District of New York (see indictment). The FBI, the NYPD, the city Department of Investigation and the U.S. Labor Department, Office of Inspector General, also announced the bust. The Labor Department? Were they illegally collecting unemployment, too? Ianniello, who has been in organized crime for some forty years, can get up to 20 years in prison; his sentencing days is scheduled for March 14 of next year, according to prosecutors. Hey, this is a Genovese crew! This is their job! They're supposed to shake down San Gennaro! Doesn't law enforcement have any sense of tradition? Yes, former mayor Rudolph W. Giuliani, who recently seemed to wistfully acknowledge that he missed the old days, when the "certain rationality" of Mafia violence held sway over New York, declared in 1996 that the feast was "gangster-free," except for a few minor incidents, such as one effort tied to Joe "Rat" Massino and the more recent move by Ianniello (who also runs a cannoli shop) and his crew in 2008 to shake down vendors. But what is the larger trend? I quote from the New York Times: "Little Italy — or Littler Italy, as certain wits have called it — has lost a good deal of its square footage and authentic flavor over the years. Caught between an encroaching Chinatown and a growing SoHo fashion trade, its pork stores and red-sauce joints have been left to huddle largely on its main drag, Mulberry Street. The 2010 census failed to find a single neighborhood resident — not one — who was actually born in Italy." Could there be a correlation? I am playing devil's advocate, of course, but the question is worth considering. If the mob were shaking down the feast, if it was earning off it, would it have shrunk to what it is today? For me, the answer is, no. where the festival would be banned. If it were a Mafia ATM machine, I think it would still be thriving. The merchants were shaken down -- but they had a business. The Mafia bleeds people, but not to death; they know if you don't earn, they can't steal from you. How much are merchants earning off this vastly smaller feast, compared with the ones held in years past? What about the merchants not there anymore, earning zip. Ask: were they better off 10-20 years ago? I am NOT advocating crime, but some things... I don't know. It doesn't seem as black-and-white to me as it seems to appear to others. Reading the Times story, others seem as wistful as the former mayor (and myself) about the Mafia's historical footprint in Manhattan. "Mr. Berkowitz, who once described his own relation to the feast as “the hired help, the Jewish guy from the Upper West Side,” said he had no idea that gangsters still ran roughshod over its vendors. But it's not LCN that is described by the Times as "the most serious recent threat to the festival." That rubric the newspaper reserves for "a coalition of fashionable newcomers — baristas, owners of designer stores and residents who use the name “NoLIta” — [who] filed a motion with Community Board 2 to reduce by half the footprint of the fair. Though the motion was defeated by a 20-to-13 vote, the board won some concessions from the feast." What, may I ask, were the reasons for that "coalition of fashionable newcomers" to try to "reduce by half" a New York event so closely tied to Italian heritage? What if a fashionable group of newcomers tried to have the Puerto Rican parade cut in half? Or [name any ethnicity]? And I have nothing against Puerto Ricans; I loved one, loved her -- every single inch -- and would've married her. But she cheated on me with another guy. I'll never forget her. Back at the time, a New York Post story on the "fashionable newcomers" quoted one "coalition member" saying: “They come in with greasy hands” and stain the leather handbags and $300 dresses, said Ying Ying Chong, owner of White Saffron, one of the hip shops that have popped up on Mulberry Street between Kenmare and Houston streets — the blocks where the festival would be banned. "I rarely write in anger, but this article in the NY Post pissed me off enough to rant and rave. If my blog is incoherent at times, just blame it on the devil still in me. Glad I'm at a computer rather than down the block on Mulberry Street. "It seems I get more infuriated each day by the official hypocrisy of the media and government in this country, and the general sheep-like acceptance of any crap by citizens who are either too distracted, too self-absorbed, or just too damn stupid to realize what’s going on around them. "Going back over a century or more, Italians have been a silent minority group that could be officially abused without any recourse. To say that they didn’t bring any of it on themselves would be a lie. However, history should be truth. ..."
There would have been so much heat the woman would've lost her business--people would've protested with signs in front of the store. I just walked down Mulberry Street today and probably for the last time. It's best that they just shut it down and tell everyone to go to the Bronx or Staten Island, Long Island or even Howard Beach. I've written a couple of responses about this neighborhood a couple of times. It's a sad state of affairs when you have an Indian (a dot head, not tonto) hawking cannolis in front an old social club that is now a cigar store with a San Gennaro statue surrounded by Indian (tonto) memorabilia. I remember walking by the Ravenite social club when I was a kid with the caddies parked on the sidewalks and no one daring to even fool around. Fast forward to today -- a lot of the business owners never thought things would change and the wiseguys would be around forever. They were wrong, and now they're getting dumped on and pushed out. In all honesty Little Italy lost its flare, because there are no more Italians around at all, only Albanians and Mexicans, save for a couple of Neapolitans at Café Napoli and Da Gennaro's. Unfortunately, Staten Island is more suburban than city. It's too spread out. I have to stop writing now, because I am feel I'm getting old and depressed.